New features make stand-alone backup app ChronoSync easier and quicker to use —AppleInsider sees if it can add to, or replace, Apple's Time Machine. You've lost work —you know what it's like. Nothing digital is safe unless there's a copy of it, and ChronoSync is one of many apps that aim to create those copies and prevent data loss. It aims to safely and securely create backups of your work and to do so regularly. It's also about taking as much of the task away from you and automating it so that it's always done and you never forget. However, unlike Apple's own solution, Time Machine, ChronoSync is built to scale. Its sole purpose is to backup and save your work, but it brings a remarkable, barely conceivable number of options to the job. It's not an app you'll buy today and master by the morning. However, it is an app that you can buy now and run for years. TimeMachine is Apple's backup solution, and it's pretty solid. Solid, but slow, - almost excruciatingly so. We did a full bootable backup of a 250GB drive with 212GB of data on it with both applications, and had a wildly different experience. Backing up to a 1TB USB 3.0 drive, the backup with Time Machine took nearly five hours. ChronoSync performed the same task in a quarter of the time, in one hour and 23 minutes. We worked with the same machine for a month, and we updated the backup. Time Machine took another two hours to change 88GB worth of files. ChronoSync updated the backup in 41 minutes, again less than half the time. To stress both systems, we added 100GB of data on an external drive to the backup. Time Machine essentially choked on it, and re-backed up the entire mess, taking over six hours to complete. 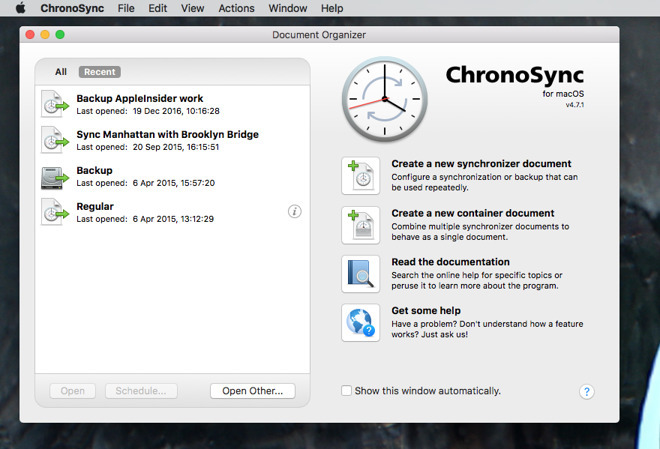 ChronoSync added it seamlessly to the backup in 38 minutes. The developer claims over 50 improvements or new features since 4.6 but the new ChronoSync 4.7.1 concentrates specifically on two areas. You can now use app to backup to more types of storage and it can also do the work faster in certain circumstances. 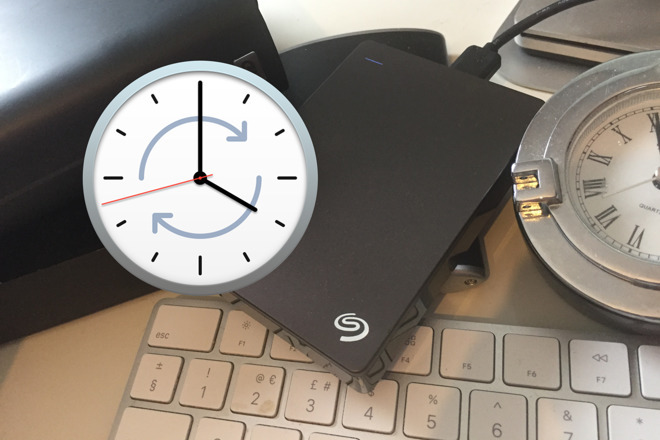 Previously, ChronoSync has been designed for backing up to local or network-attached hard disks and it's included ways to deal with disk images. Now it's improved how easy it is to mount and use disk images but most significantly it's expanded to include cloud services. If you have accounts on these services, then you can now backup and synchronize your work to Amazon S3 or Google Cloud Storage as if they were hard drives directly connected to your Mac. These are robust cloud services but they are still in the cloud and keeping a connection is an issue when you're backing up enormous quantities of data. Then, too, you could mistakenly pull out a local hard drive early. When there is any interruption, a new feature called "Progressive Scan" helps. Usually when you're using ChronoSync to make a copy of an important folder or drive, there isn't really a great deal in there that changes from day to day. You might have updated one single document, for instance, in which case copying over everything all over again is a time-consuming waste. So usually the first thing that ChronoSync does is look at the status of every file to determine whether it needs to be backed up again. With a lot of files, that can take a great deal of time that is wasted if the backup is then interrupted. Previously, when you reconnected a drive, ChronoSync would restart the entire scan. Now, however, if it can pick up where it left off, it will. There are reasons you might want to manually start and watch a backup but more often you want to set it up once and then let it run itself. In either case, you tell ChronoSync what you want backed up and where you want that backup to be saved. As we said, there are a ridiculous amount of options in Chronosync, but the rubber hits the road at what and where. Despite a quite extraordinary number of possible options and settings you can use, ChronoSync always starts off with a reasonably straightforward approach. It's not as easy as Time Machine, and when you're working to create backups of important data you need to take your time to make sure you're getting it right. However, you can be backing up and syncing in minutes even if it might take you months to explore all the options for when files are backed up and what happens to them. 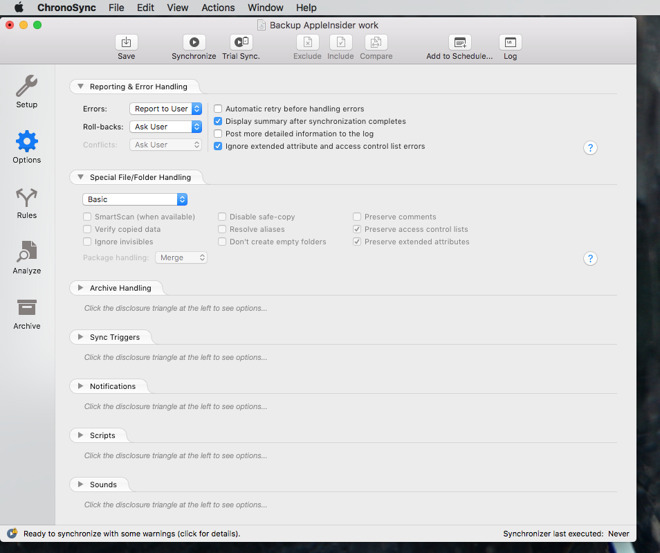 One last way that ChronoSync 4.7.1 speeds up your work is to do with how it helps you cope with problems. Disk drives can be unreliable devices and file systems like macOS Sierra's are complex so there can be difficulties there as well. ChronoSync has been good at spotting potential issues with both and warning you, but now it goes further. If it's a problem that can be fixed by clicking on a single option, ChronoSync now tells you the problem and what the solution is. Plus the help text telling you what option needs to be clicked will include a button for that option. So you can click on it right away. This is called Smart Readiness Warnings and the type of issues it spots can smooth over creeping data crud caused by an array of file system problems. This is just the first article thoroughly examining several macOS backup options, and a detailed head-to-head comparison between our candidates will wait until all the pieces are done. 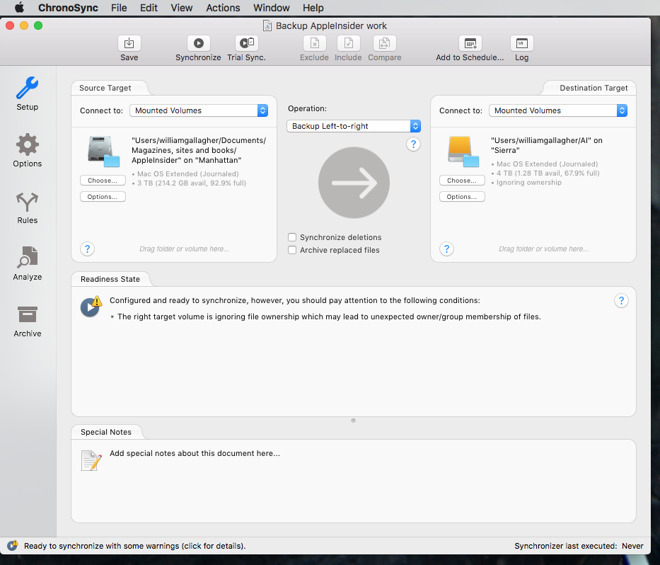 Time Machine is an easy to use option, with little initial configuration. ChronoSync is ridiculously configurable, and speedier, than Time Machine, and can be configured for rolling backups similar to Time Machine. In a vacuum, with no other considerations users who want the simplest solution possible should stick with Time Machine. The two operate harmoniously, though, and more advanced users needing a comprehensive solution including cloud services should seriously look at adding ChronoSync to their arsenal of tools. ChronoSync 4.7.1 is available directly from the developer Econ Technologies and costs $49.99. There is also a free iOS app that lets you control your backups from your iPhone or iPad.